For the Atari 2600 game, see Breakout (2600). 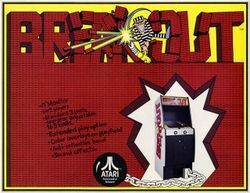 Breakout is an arcade game developed by Atari Inc. and introduced on May 13, 1976. 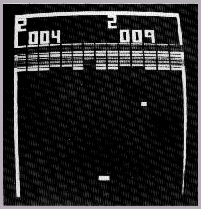 It was conceptualized by Nolan Bushnell and Steve Bristow, and influenced by the 1972 arcade game Pong. The game was ported to video game consoles and upgraded to video games such as Super Breakout. In addition, Breakout was the basis and inspiration for books, video games, and the Apple II personal computer. In the game, a layer of bricks lines the top third of the screen. A ball travels across the screen, bouncing off the top and side walls of the screen. When a brick is hit, the ball bounces away and the brick is destroyed. The player loses a turn when the ball touches the bottom of the screen. To prevent this from happening, the player has a movable paddle to bounce the ball upward and back into play. The arcade cabinet uses a black and white monitor. However, the monitor has strips of colored cellophane placed over it so that the bricks appear to be in color. 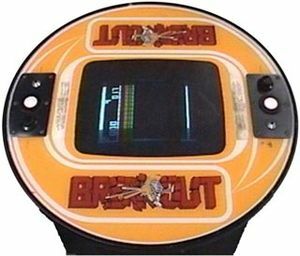 The original Breakout is not featured in the arcade emulator MAME since the game is constructed from a series of discrete logic circuits. There is no processor in Breakout — the game must be "simulated" rather than emulated. Atari made the game available for play at home, first on their dedicate console "Video Pinball," and later as a cartridge for the Atari 2600. Breakout, a discrete logic (non-microprocessor) game, was conceptualized by Nolan Bushnell and Steve Bristow, after the latter had "rejoined" Atari after the merge of Atari subsidiary Kee Games. They had an idea to turn Pong into a single player game, where the player would use a ball to deplete a wall of bricks without missing the ball on its rebound. Bushnell was certain the game would be popular, and the two partnered to produce a concept. Al Alcorn was assigned as the project manager, and began development with Cyan Engineering in 1975. The same year, Alcorn assigned Steve Jobs to design a prototype. Jobs was offered USD$750, with an extra $100 each time a chip was eliminated from the prospected design. Jobs promised to complete a prototype within four days. Jobs noticed his friend Steve Wozniak—employee of Hewlett-Packard—was capable of producing designs with a small number of chips, and invited him to work on the hardware design with the prospect of splitting the $750 wage. Wozniak had no sketches and instead interpreted the game from its description. To save parts, he had "tricky little designs" difficult to understand for most engineers. Near the end of development, Wozniak considered moving the high score to the screen's top, but Jobs claimed Bushnell wanted it at the bottom; Wozniak unaware of any truth to his claims. The original deadline was met after Wozniak didn't sleep for four days straight. In the end 50 chips were removed from Jobs' original design. This equated to a $5000 USD bonus, which Jobs kept secret from Wozniak, instead only paying him $375. Atari was unable to use Steve Wozniak's design. By designing the board with as few chips as possible, he also cut down the amount of TTL (transistor-transistor logic) chips to 42. This made the design difficult to manufacture — it was too compact and complicated to be feasible with Atari's manufacturing methods. However, Wozniak claims Atari could not understand the design, and speculates "maybe some engineer there was trying to make some kind of modification to it". Atari ended up designing their own version for production, which contained about 100 TTL chips. Wozniak found the gameplay to be the same as his original creation, and couldn't find any differences. This page was last edited on 29 November 2008, at 20:56.